Average Wait – Average waiting time per queue. A describtion of the AQ and Streams views can be found here. This entry was posted in Database, Oracle, Service Bus, SOA Suite and tagged Advanced Queueing, AQ, AS, Fusion Middleware, Messaging, Oracle, Service Bus on 2009/12/23 by PeterPaul. One of the projects I’m involved in, uses Oracle ESB (from SOA Suite 10.1.3.3 MLR 18) running on AIX 5.3. 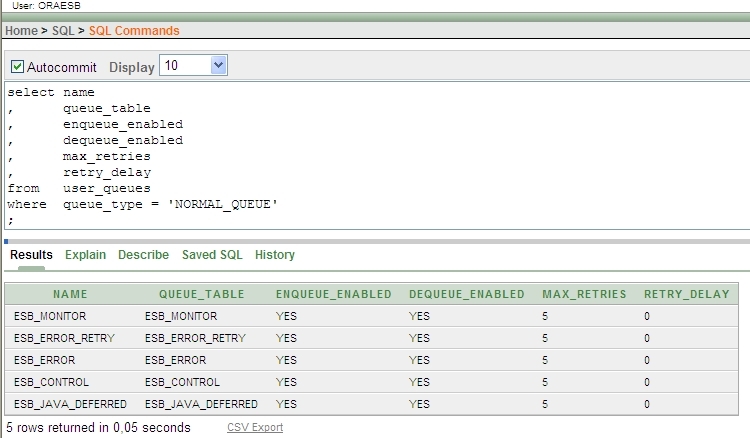 Instead of using the default in-memory JMS the ESB is configured to use Oracle Advanced Queueing (AQ). Although there were tuning efforts before, the performance wasn’t up to par. AQ seemed to be the bottleneck, especially the dequeueing part. During the day we saw the number of messages queue up. Generally these numbers would decrease after business hours. This should have been a big problem if the number of messages wasn’t going to be tripled or quadrupled in the next month(s). Previous attempts in cooperation with Oracle Consulting hadn’t done the trick, yet. To get a fresh view and some out-of-the-box thinking Marc joined the team. He performed a scan of the systems settings. Researching Oracle’s knowledge system resulted (searching on AIX & ESB & DB Adapter) in the clue to upgrade the JVM (6848406 – SLOW PERFORMANCE ON AIX ESB USING FILE AND DB ADAPTER). Although we were skeptic at first, because why tried a similar path before, we decided to give it a shot. The previous attempt resulted in errors in our code without enhancing the performance of the system. and the start the SOA Suite. With this newer Java version we had a significant performance improvement. Unable to make a connection to OC4J instance oc4j_soa on Application Server someserver.local. A common cause for this failure is an authentication error. The administrator password for each OC4J instance in the Cluster must be the same as the administrator password for the OC4J instance on which Application Server Control is running. This can be solved by applying the patch for base bug 5261515. The patch adds some security jars and properties that are not in the AIX Java5 version. Since this patch introduces issues in our code, we are working around the Em problems for now, while trying to resolve the issue. This entry was posted in Oracle, Service Bus, SOA Suite and tagged Advanced Queueing, Fusion Middleware, Integration, Java, JVM, Oracle, Service Bus, SOA Suite on 2009/11/26 by PeterPaul. As a quick follow up on the previous post… If you are using a JMS queue with Oracle´s Advanced Queueing or Streams (as they have been extended to) the previously described tool can´t help you out. You need something else for monitoring AQ. Find the queue you want to monitor AQ. This entry was posted in Database, Oracle, Service Bus and tagged Advanced Queueing, Database, JMS, Messaging, Oracle, Service Bus on 2009/04/16 by PeterPaul.